After packing up at Aberdour Conservation Park, I headed back to the Riddoch Highway and travelled south towards my next activation which was the Christmas Rocks Conservation Park, which was to be another unique park for me as an activator. It was just a very short drive from Aberdour CP. 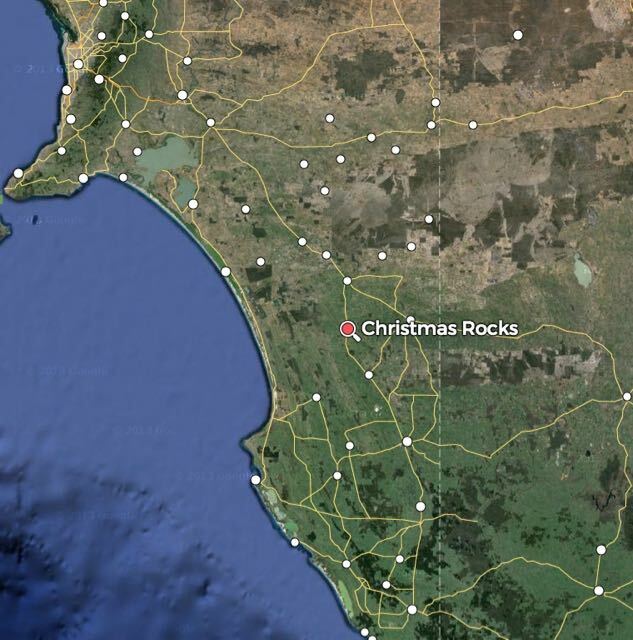 The Christmas Rocks Conservation Park was proclaimed in 2014 and is just to the north of the little town of Willalooka. Don’t blink, because you will miss the park. There is just one small brown sign on the western side of the Riddoch Highway, with a camera sign and the words Christmas Rocks. If you’ve reached Willalooka when travelling south, you have come too far. The park itself consists of some fairly dense scrub and a series of granite rocks which were once part of the archipelago of granite rocks in the shallow sea that covered the Limestone Coast some 25 million years ago. I recommend taking the time to walk to the top and admire the views of the surround countryside. It is a very easy 10 minute walk from the carpark. Sadly, there is no real defined park. It is another example of the poor state our parks are in South Australia. Prior to activating, I did exactly that. I took a walk up to the top of the granite rocks while the showers had disappeared. Although not high above sea level, there are some very good views of the district. I set up in the scrub about 10 metres in from the carpark. The weather was still terrible, so I didn’t want to be too far from the vehicle. I had hoped to take the Yaesu FT-817nd up onto the top of the rocks, but it was just too wet. So I quickly set up the equipment, my Yaesu FT-757d (set on 40 watts) and a 40m/20m linked dipole supported on a 7 metre squid pole. I called CQ again on 7.095 and this was answered by Tony VK5FTVR at Strathalbyn, followed by Scott VK5FSKS mobile at Swan Reach with a nice 5/8 signal, and then park stalwart, Mick VK53PMG in Stawell in western Victoria. Eugene VK5ZA mobile at Auburn in the Clare Valley was next, followed by another park devotee, Adrian VK5FANA on the Yorke Peninsula. Whilst I was operating, the area was alive with birds. Of the feathered variety! The gum trees were in flower so that attracted the New Holland Honeyeaters. There was also a large number of Superb Blue Wrens and Fantails. After the callers had slowed down, I had a quick tune around the band and found Phil VK2JDL calling CQ from a SOTA peak, Mount Coryah VK2/ NW-004 in the Mount Kaputar National Park VKFF-353. Phil was my last contact (5/7 both ways), just as the rain started to come down again. It was a quick pack up and back to the vehicle. After 40 minutes in the park, I had a total of 22 contacts in the log from VK2, VK3 & VK5.